Do you like booze and manicures? Sure, we all do! Then come check out Essay Fiesta’s Keith Ecker this Sunday. He will be reading at the Two With Water Rx reading series. The monthly event takes place at the Beauty Bar, Chicago’s hippest hipster martini-manicure bar. 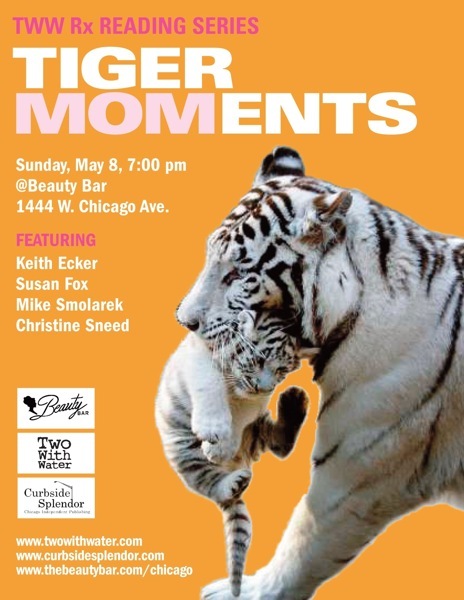 In honor of Mother’s Day, the theme is TigerMOMents (see the poster below for a visual depiction of said theme). The event is sponsored by the Beauty Bar, Two With Water and Curbside Splendor (the publishing company run by past reader Victor David Giron). There will be drink specials. There will be manicures. There may be blood (but let’s hope not). Show starts at 7 with an open mic. And it’s free. « Essay Fiesta’s May Line-Up!